I appear to be a dumbass. I've looked at these files, but somehow never viewed that specific one. Gosh, I'm an idiot. Looks like 0-20Â° does 0.1x damage meaning a ricochet, 20.01Â°-44.99Â° does 0.8x damage, 45Â°-74.99Â° does 0.95x damage, and 75Â°-90Â° does 1.1x damage. Just finished testing the Mondragon, 1906, and 1916 (all 35 Minimum Damage SLRs) and they all definitively kill in 3 max limb shots. An interesting result, however, is that the HUD displays damage dealt (the shooter) at both the 33 and 34 interval and sometimes out of order. Possible patterns recorded are 33, 34, 33 | 34, 34, 32 (there was no situation where two consecutive 33s appeared). The last value in each is largely irrelevant because in both cases 33 and 32, respectively, are the minimum amount required to kill the opponent. So the 33 and 34 values transpose, for what reason we were unable to identify, but in each instance 34 damage appeared at least once indicating that any engagement with 3 successful hits wil guarantee a kill. Also to note, the target's health bar can display +/- 1 damage received that the shooter inflicts. For example, the shooter's HUD displays a hit of 34, but the target's health reads 67 HP (33 damage). However, in each experiment it followed with a shooter HUD amount of 33 and a target health amount of 33 HP (34 damage), so these values can transfer but will always even out. Obviously, the discrepancies aren't the same, but there could be a UI bug that displays the wrong amount of damage dealt according what should only be mathematically possible. Like the case of our potential 3 angle multipliers (excluding ricochet) displaying 3 more damage possibilities than it should. Also, yes, you should totally make a thread detailing anything and everything pertaining to vehicle stats. That would be greatly appreciated. Here are some Pictures of the new variants and their assignments. Well would you look at that! Hot damn! 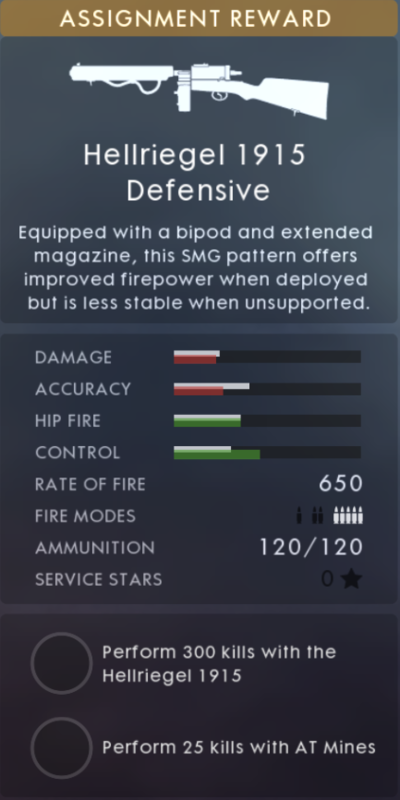 The Hellriegel Defensive has two 120 round mags. I was close! 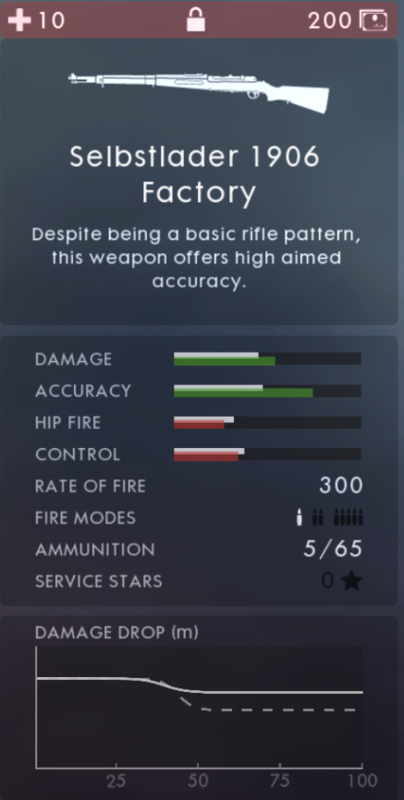 Could you screenshot the stat bar comparison of the Hellriegel Storm (Factory) with the Hellriegel Defensive? 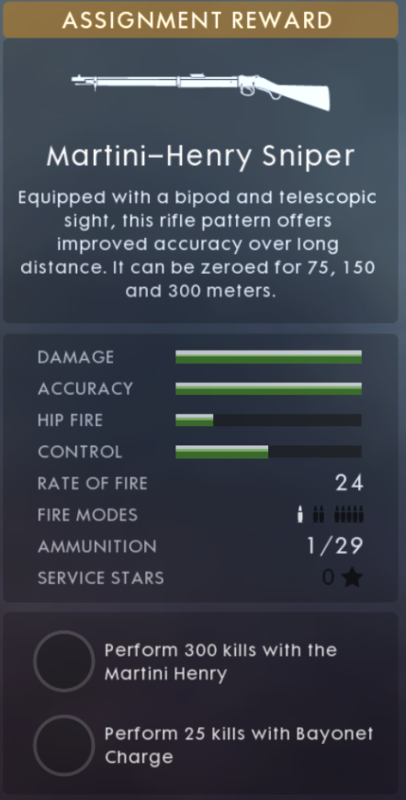 It won't give us an accurate reading of what the true stats will be but we'll be able to see if it has worse Hip-Fire, Accuracy, or possibly Damage. I'm not a fan of the 300 kill requirement, I'm guessing this is to satisfy the community's lust for progression but I think 75-150 kills would be much more reasonable. Alright then, by the looks of it the Defensive variant is better in terms of damage, spread/ recoil, equal in hip-fire, and worse in whatever 'Control' includes. Nope. 300 kills seems like overkill, considering you already have to get the Rank 10 base gun first, and it's just a slightly different variant. 100 would be far more reasonable. Those stat bars definitely look to be placeholder, there's no chance they actually differ in damage. I'd bet that once we get Ammo 2.0 for small arms, the Hellriegel Storm Factory will get 60/60 while the Defensive will get 120/0, without Support's Overcharge mechanic. It's totally absurd. I only have that many kills with my top weapon for each class. The damage bars is that way because I have the Ribeyrolles 1918 equiped in CTE. But seeing as how both Hellriegels are locked, essentially, we won't be able to know unless one is equipped and then compared with the other. Or we could just get confirmation through the CTE Data Files, but I don't know how to access those...that is if they are accessible to the public at all.